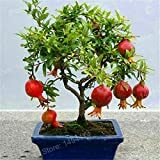 Pomegranate plant for sale – is best grown from cuttings. Plants are available from nurseries usually in five-gallon containers. This is the most preferred mode of propagation since cuttings ensure the quality of the fruit produced within a year of planting. It will take 5 to 6 years from the time of planting for your pomegranate tree to mature and produce large harvests. Pomegranates are self-pollinating trees, so you only need one to set fruit. They are relatively hardy and will bear fruit within the second year. Pomegranate fruiting season lasts up to 7 months in cool dry conditions. The best time to plant a pomegranate tree is in the spring. 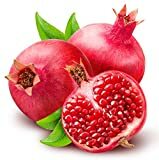 Location – choose a location with full sun for your pomegranate. They will only fruit reliably when they get enough sun. If you plan to grow multiples, allow a 20 feet diameter space for your trees to grow into. You can also opt to plant them as close as 10 feet apart if you are planting them as a hedge. The ideal climate for planting pomegranate is in an area with short, mild winters and low humidity. Pomegranates thrive in areas of warm, arid conditions. Soil – Pomegranates are adaptable to many soil types but grow best in loamy, well-draining soil. Alkaline soil is perfect for planting pomegranate trees. The addition of a very small amount of limestone or garden lime to the soil should be sufficient. Water – They have relatively low water requirements and can survive drought for several years. Although, too much or uneven amounts of water, either from irregular or over irrigating, heavy summer rains, or high humidity, can result in fruit cracking, decreased fruit production, and other problems. Water the tree deeply about once a week; possibly more often during peak summer months. Pruning – Once your tree turns a year old, select 1 to 6 trunks to keep and prune the rest to the ground. This will help your tree produce fruit sooner. Never trim all the branches all in the same year. You should also prune back any new suckers that you don’t want to grow into trunks. Diseases – Pomegranate trees are prone to fungal diseases. Control fungal issues starting before the fruit develops in early spring and continue through summer as fruits mature. Use a copper fungicide and promote good circulation by pruning in the dormant season to open the canopy, although, good healthy trees are less likely to be bothered by minor fungal issues. Removal of diseased leaves, twigs and fruits can help control the spread, along with fungicide application. Harvesting – As soon as they reach their mature skin, pomegranate fruits can be harvested. They usually feel heavy and sound metallic when tapped. Do not leave the fruits on the tree for too long or they will split open. Harvesting is done with pruning snips and not by pulling from the branch. Store them whole in a cool place for several weeks or refrigerate for 3 months.